Top Ten Tuesday: Oh Yeah! Believe the Hype? I usually wait until the hype dies down before reading a book. I’m always afraid it will fall flat, and I’ll be disappointed. However, over the last 12 months or so I’ve been pleasantly surprised at books that have lived up to the hype. Have you read any of the books on either list? If so, did they live up to the hype or fall flat? I hated the way Dark Matter ended, probably because I wanted more. I don’t feel like I got closure. I have heard great things about Crazy Rich Asians and I’m excited for the movie. I haven’t read any of these books yet. I keep hearing conflicting things about Ready Player One. Some people say the book is better than the movie, and other people say that this is the one time that the movie is better than the book. Hyped books scare me. That’s why I don’t read many of them. I loved Simon, though, so I hope you like it too. Thanks! I’m looking forward to reading Simon. Now all I have to do is wait for the movie hype to die down. I think they are being ‘hyped’ more. I think what’s happening is that publishers are promoting books more aggressively now and they are taking full advantage of social media. Oh yes thats true, social media does make it easier for them to pump out promotional pieces. Americanah is SO GOOD and it deserves the hype in my opinion! That’s what I hear. One day I’ll get to it. I’ve been putting it on one TBR list after another for at least 3 years and it keeps getting pushed further and further down the TBR pile. Must. Read. More. Thanks! I think it will be too. Now all I have to do is wait for the hype of the movie to die down. A vicious cycle. I keep seeing Crazy Rich Asians all over the place. Maybe I need to pick it up. I still wonder if it’s a book for me though. I guess there’s only one way to find out! Well, there is a movie coming out this month. Check it out from the library if you’re skeptical. I’ve heard really good things about it since it came out. I have heard good things as well. A friend of mine loves them! I will have to look into it. Dark Matter and Ready Player One are both on my TBR! Great list. I really enjoyed Dark Matter. I started reading Ready Player One and was enjoying it, but not sure why I stopped. Probably because a newer shinier book popped on the scene. Good to know that The Hazel Wood was good! I have been staring at that one wondering if I should read it. Love this list! You definitely should give it a go. I was definitely not a fan of the ending; but it’s a series, so okay. It was a quick read and spooky in parts. Her description of the Hinterland is phenomenal. Awesome list! Americanah is soo good. I only read it last year and I want to reread it again as well as buy a copy for my bookshelf. While it’s fiction, it really opened up my eyes to the immigration experience and made me look at things in a whole new way. Thanks and it’s good to know that there is something that can be learned. I seem to enjoy books more when I’m provided a learning experience. Excellent list, Erica! THUG made my TTT list too. It really deserves all the hype it receives and then some! 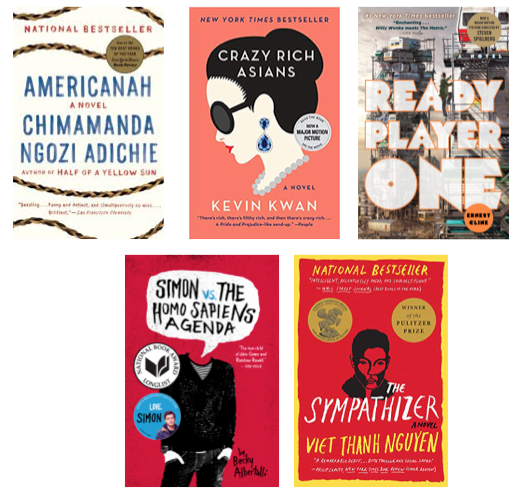 I’m also hoping Americanah and Crazy Rich Asians are as good as their buzz suggests. Thanks! I’m trying to decide whether or not to reread the book before the movie comes out in October. I’m thinking I’ll do a book/movie tie-in review. I have heard nothing but good things about Americanah and Crazy Rich Asians. I think that Ready Player One and Simon Vs. both lived up to the hype for sure (Simon Vs. made my list! 🙂 ) and YAAAS. 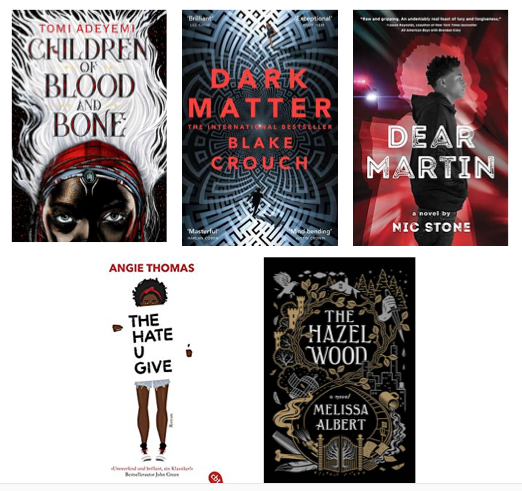 Children of Blood and Bone and THUG ❤ ❤ <3. Great picks! Thanks! I’ve heard good things about them. Now I have to wait for the movie hype to die down for them. Oh My Gosh! CoB&B and THUG were great! Loved them! CoB&B is definitely the best book I’ve read this year. I find that movies rarely do live up to the book. I guess it’s because they can’t include everything in book in the movie.